Nitrogen – Vermont Tire & Service Inc. Racing tires (NASCAR, IndyCar, Formula 1), aircraft tires and heavy duty equipment tires have all used pure nitrogen to inflate their tires for years. Is there a benefit to inflating passenger tires with nitrogen? 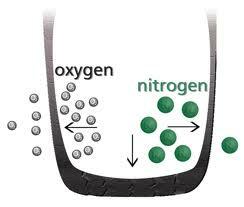 Below we describe the difference between filling your tires with nitrogen vs. regular “air”. • Nitrogen molecules have a more difficult time escaping through a tire’s rubber than oxygen. In general, this means your tire pressure will remain more stable over time. Nitrogen also has less pressure changes with temperature swings. This is why it is used in racing (more consistent pressure during a race as the tires heat up). We still suggest you check your tire pressure monthly, regardless of what they are filled with. • Nitrogen is a “dry” gas which means it will not support moisture that could contribute to corrosion of the tire’s steel and aluminum components (such as rims and belts). Obviously, water is a bad thing to have inside a tire because it causes more of a pressure change with temperature swings than dry air does. Unfortunately the compressed air often provided at filling stations contains varying degrees of moisture depending on relative humidity and the compressor system’s ability to dry the air by removing moisture. So, who are good candidates for filling with nitrogen? If you are interested in nitrogen, we can purge and refill your tires with nitrogen at our Burlington store.